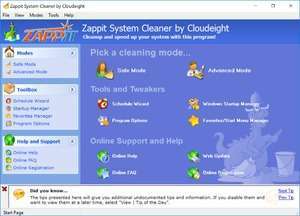 Zappit System Cleaner is a powerful software that cleans up and speeds up your PC. It cleans Windows, Internet Tracks, frees up hard-disk space and optimizes your system. A clean computer runs better and faster and Zappit makes it easy to clean temporary and unused files in just a few seconds with no need to worry about deleting the "wrong" files. currently includes a Start-Up Manager and a Favorites and Start Menu Manager. Version 1.11 is a freeware program which does not have restrictions and it's free so it doesn't cost anything. For security reasons, you should also check out the Zappit System Cleaner download at LO4D.com which includes virus and malware tests. Additional screenshots of this application download may be available, too.